what's wrong with it? it's out of date again isn't it? why cant I just smell it? why do I always have to taste it? why can't you inflict these things on Phantom? You really crack me up, I'm still giggling at the thought of poor Sinus having to try that yoghurt. Only you would buy things so you can paint the packaging and I love that about you. Just remember when I come for a cuppa, NO experimenting on me!!! I just wanted to go to bed a bit unhappy when I saw your new post. What a hero! I'm not too happy with my hubby of 36 years at the moment, so I think I'll put him to the test... I'm off to market to see what hideous concoctions I can find. Your post had my giggling as usual (you're hilarious) and your painting is brilliant. So vibrant. I love it although I doubt I'd feel the same sbout the taste. Crazy....he is crazy about you, for you, and with you! 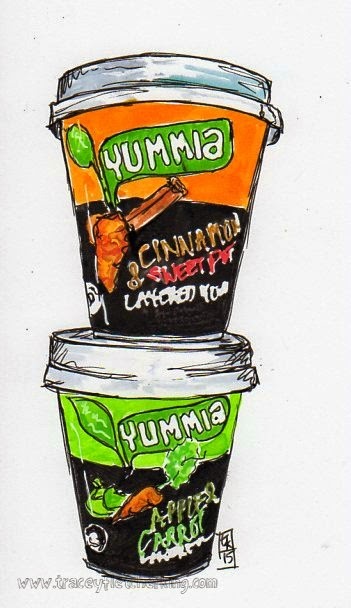 !lol I'd never try the sweet potato one since I don't like sweet potato...however I'd use in our indian chicken palak dish...it would be so yummy in that!! Great way to hide veggies in food!! Wonderful artwork my dear!! Just love your adorable antics...you have a book with all this humour and eye candy! Ha, funny the whole falling asleep in front of the telly thing is very familiar - S is the same! Good on Sinus for trying those flavours for you- they do sound a bit bizarre - I'm not a fan of mixing my sweet and savoury food in the same pot! Great pots they are though and as always you've done them justice with your artwork! I think you must be married to my husband too. Ha-ha. 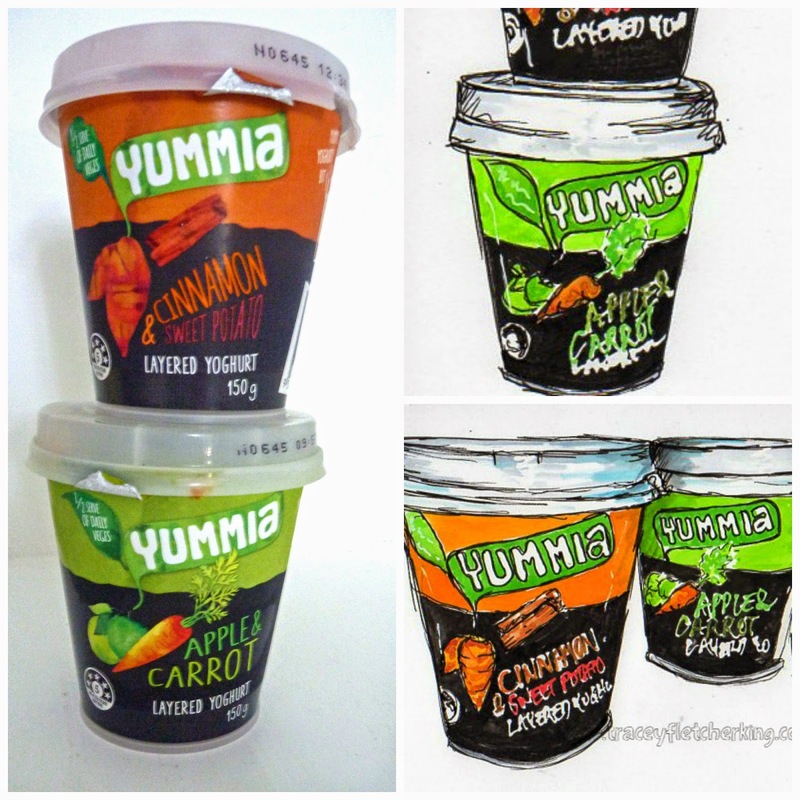 Wow- we don't have veggie flavored yogurts here in the States but they do sound yummy. And once again, enjoying your pieces. 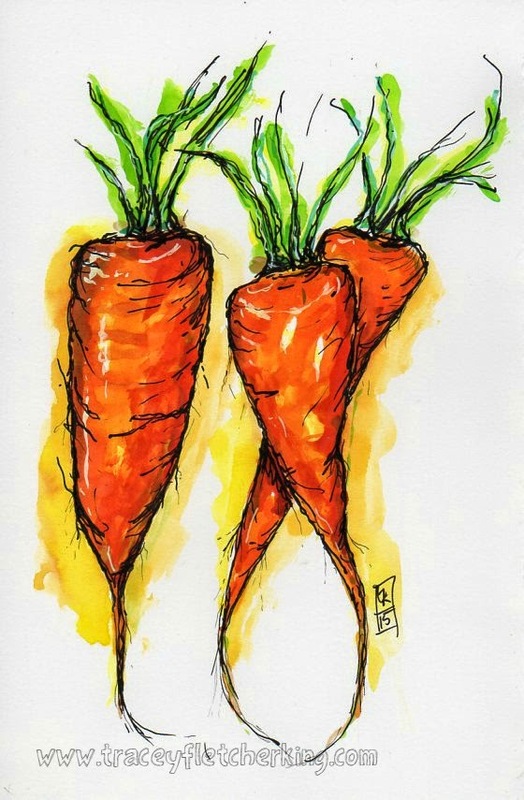 The carrot video was a great little peak into your style. Have a great weekend. Tracey, as we fisher persons say: Sinus is definitely a keeper! What a sacrifice, tasting those unknown flavors of yogurt like a trouper! The flavors sound strange to me, but I like trying new yogurts. But the texture is more important to me too. Love your painted renditions. i so enjoy your humor, life full of humor, my favorite sort. loved seeing your odd yogurt art. hope you are well, it has been so long since i dropped by! Great post, your hubby sounds like a lot of fun. The yogurt sounds interesting. Love the illustrations. As always you leave me with a smile on my face. 25 years is a quarter of a century, and not to be sneezed at (volcanic or not. Congratulations. I'm with you--the packaging is lovely but the flavors sound suspect. He is definitely a keeper! You are fortunate to have such a willing person for scientific research at your disposal! How about acorn squash with cinnamon, you get your veggies and milk allowance all at once. My mom was in bed one night and her finger hurt - she gave it a tug in hopes that it would pop but instead she let off a toot! Yup - she pulled her own finger! One of our most favorite family stories! Maybe he was just afraid that you might attack him with another bunch of Curly Kale, haha! I'm not sure I'd have been so ready to dive in either - Let's face it, those flavours seem a little 'out there' for a yoghurt! You seem to get some very weird food down under!! 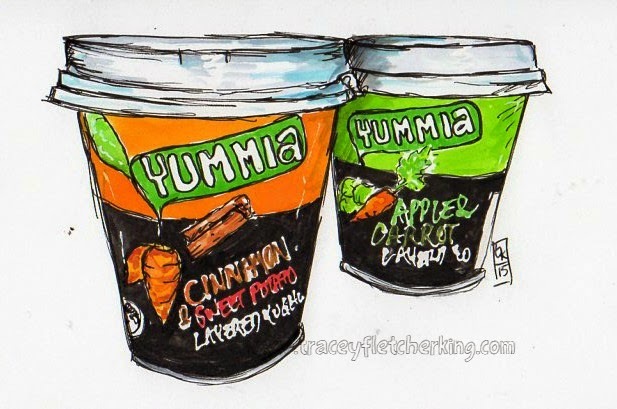 They sound yucky but are called Yummia, so maybe I am wrong. Luckily I don't have to find out! Yes, Matt is clearly a keeper for sure! 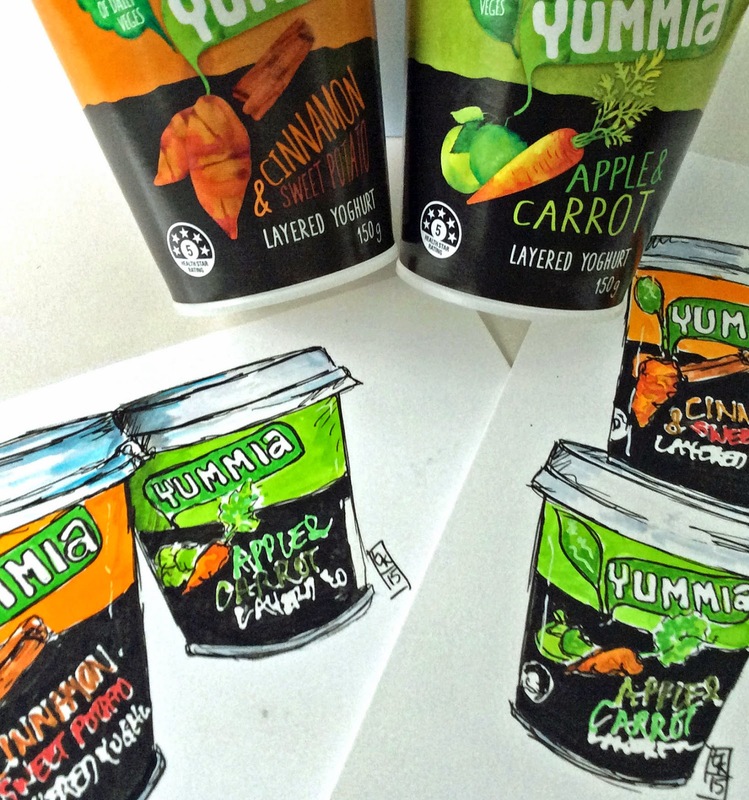 Of course your paintings of the Yuckia - sorry, I mean 'Yummia' - are completely gorgeous! Be careful though - they may be asking you to design their packaging next!! !